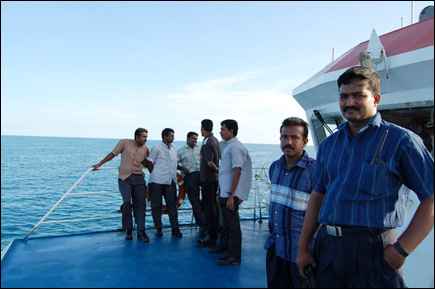 Liberation Tigers of Tamil Eelam (LTTE) cancelled the sea-transportation of their Acting Commanders to Eastern district Saturday morning from Vanni after getting on board the ferry. The Tiger officials "spotted suspicious movment of four Sri Lanka Navy attack vessels issuing instructions to the ferry over VHF Marine Radio," said Director of the LTTE Peace Secretariat S. Puleedevan from Mullaithivu shore. "We were forced to cancel the transportation of Acting Commanders at the last moment after the breach of agreed procedure," Mr. Puleedevan said. 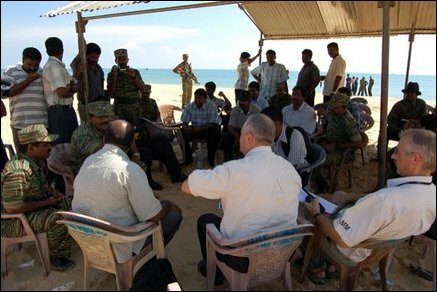 Eastern Commanders of the LTTE were scheduled to travel to Vanni on the same ferry. "LTTE officials on board the ferry spotted four Sri Lanka Navy Dvora Fast Attack Crafts (FAC) around 3 nautical miles close the ferry," Puleedevan further said. The close movement of the SLN attack vessels and direct instructions being issued to the ferry by the SLN, violated the agreed procedures, he further said. "The transportation arrangement was meant to be an exclusive SLMM arrangement without the involvement, interception or interruption by the SLN." But, the procedures the ferry was subjected to follow in practice were different than what was agreed. The captain of the ferry was receiving direct instructions from the SLN vessels over the VHF Marine Radio. "Every inch of the ferry's movement was monitored and made after receiving instructions from the SLN vessels in total violation to the agreed procedure," Puleedevan said. LTTE officials, except their Acting Commanders, were on board the ferry when they were forced to conclude the cancellation of the travel arrangement. 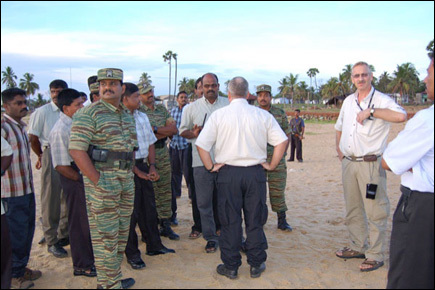 The Head of SLMM, Maj. Gen. Ulf Henricsson was in Batticaloa to accompany the Batticaloa Special Commander of the LTTE, Col. Bhanu. SLMM officials were on board the ferry which was scheduled to transport the acting commanders of the LTTE to Eastern District before transporting the Eastern Commanders Col. Sornam and Col. Bhanu to Vanni.